Telling a story about a storyteller is not an easy thing to do. And telling a great story about a great storyteller is even more difficult. 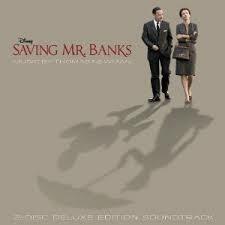 But director John Lee Hancock has excelled in his movie, “Saving Mr. Banks”. The great storyteller is none other than Walt Disney himself, and the story is the mufti-layered journey of how Disney brought Mary Poppins to the big screen. The surface layer of the story is how Disney pursued Mrs. P. L. Travers, the author of the Mary Poppins series. Disney was determined to gain Travers’ permission to make her books into a film classic and his single-mindedness in this regard resulted in a twenty year pursuit. For reasons that become apparent later in the film, Travers is ever so jealous to guard her treasure and ensure it is not made a mockery by Disney animation. Emma Thompson is absolutely brilliant playing the uptight, insecure and emotionally wounded Mrs. Travers. Thompson’s character evolves throughout the movie from an over-the-top control freak and aristocrat to someone who warms to the point of developing genuine friendships with Disney, her lowly chauffeur (played by Paul Giammati) and the poor composers who had suffered so long under her direction. The next layer of this wonderful story deals with promises. As it is, Disney had promised his children that he would make a movie of their favorite childhood story – and that was a promise he meant to keep no matter the difficulty. And Mrs. Travers, implicitly at least, had promised herself to protect the image of her characters – another promise made with the utmost seriousness. Director Hancock has succeeded wildly in resolving this age old dilemma of the immovable object meeting the irresistible force with his treatment of the relationship between Disney and Travers. A last layer has to do with families. It seems that both Disney and Travers idolized their fathers despite having suffered at their hand. (You’ll have to see the movie to find out how!) So Travers’ irrational control is explained by her love for her father and her fear of losing her memories of him. And Disney’s dogged pursuit of Mary Poppins may well be explained as a way of providing a beautiful fantasy for his children; one that was the opposite of his hard scrabble upbringing. Tom Hanks plays Disney as perhaps no one else could. There are few movies that have held my attention through their entirety – and this is one of them. It is an amazing story about an amazing storyteller with a great cast which does its job superbly. And it is the story of the triumph of gracious persistence over disagreeable resistance; and of how wounded hearts can make the world a better place. Need a last minute Christmas gift for you or a loved one? Go see this movie. It’s the spoonful of sugar you need!